Farewell, Madame VP. Who will be the next film crew to stake out ground in the DMV? "Scandal," "NCIS" and "Homeland" may pose as D.C. stories, but none are actually filmed nearby. 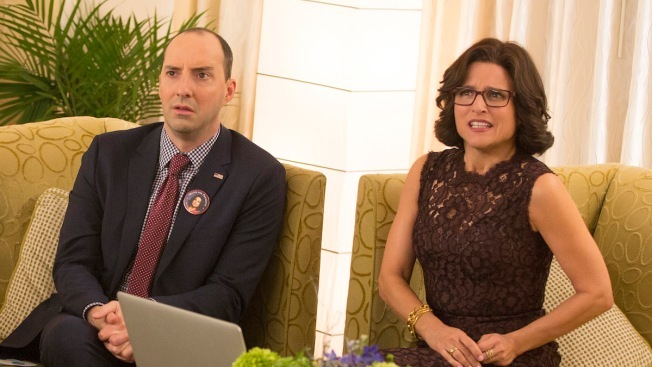 Soon, "Veep" will depart from its Maryland home and join the ranks of projects filmed in southern California but set elsewhere. We’ve dug up with some of the most interesting -- and possibly surprising -- films and TV shows shot right here. "Veep" (HBO) - Julia Louis-Dreyfus has dominated in her roles in "Washington" for a while, and done so from the comfort of Maryland. But now the show will be relocating to Los Angeles for tax credit purposes. Here’s to hoping we don’t see another Pacific Bell payphone fiasco, a la "Die Hard 2." "House of Cards "(Netflix/MRC) - The wildly successful Netflix series prominently features our city and is filmed nearby. For those fearful of running into powerful and twisted politicians in the Metro, not to worry. Even with the construction obstacles, Cathedral Heights is very clearly a made-up station. "The Wire" (HBO) - Running from 2002 to 2008, "The Wire" dug deep into the relationship between Baltimore, its institutions and law enforcement before the city gained national attention this year. "The Social Network" - We all know Mark Zuckerberg’s famous Harvard dorm room idea, but few know that Harvard never actually made it on the big screen for this flick. Filmmakers instead used Johns Hopkins because of strict rules against filming on Harvard’s campus. "The Blair Witch Project" - This 1999 horror film masked as a documentary was set in the woods near Burkittsville, Maryland. We won’t ask how many of you quit hiking and camping after watching it. "National Treasure" - The film and its sequel are centered around a great deal of history that took place in our area. Locations includes Alexandria, Mount Vernon, the Lincoln Memorial, the Library of Congress and the University of Maryland. The movie’s treasure may have been found in New York, but we’re not giving up hope that our city boasts the same secret. "He’s Just Not That Into You" - Baltimore bricks will give away the setting of this chick flick almost immediately. Writers didn’t want a typical New York or L.A. setting, so they chose the Charm City for its homey yet urban feel. "Wedding Crashers" - The raucous, hilarious film features two D.C. players and was filmed all around the area. Notable locations include the Lincoln Memorial and Assateague Island National Seashore. Scenes were also shot at the fabulous Inn at Perry Cabin on the Chesapeake Bay. "Tuck Everlasting" (2002) - The beloved novel and its movie reincarnation take place in fictional Treegap. Filmmakers for the most recent version chose Maryland’s forests to illustrate the woods with the famous secret spring. "True Lies" - The 1994 flick was filmed partly in Los Angeles (we can tell that isn’t the Key Bridge, producers) but parts were shot in Baltimore, Bethesda, Georgetown and Chinatown. "Sleepless in Seattle" - Though its title suggests otherwise, fans of the Meg Ryan/Tom Hanks hit will recognize Ryan’s character’s Baltimore Sun office. The flick also shot in Fells Point and Annapolis -- and of course, Seattle. "St. Elmo's Fire" - It’s hard not to love coming-of-age films straight from the '80s, especially when the central characters are Georgetown graduates trying to find their way in the world. Parts of the famous film were shot in Georgetown and at the University of Maryland. "Runaway Bride" - Julia Roberts plays a Maryland native opposite Manhattanite Richard Gere. The two fall in love in the Old Line State. Filmmakers even used Baltimore to portray New York. "Failure to Launch" - The successful romantic comedy is set in New Orleans but was filmed primarily in Maryland.